Former Lansing Everett and Oakland University standout Derick Nelson will play professionally in Finland. Here’s a great story about a player who finally shed the “undersized forward” label with hard work. He’s just good, and now he might just make a career out of it. Mark your calendars for November 27th. Holly High School will be hosting “Thanksgiving HoopFest” at 10 a.m. A 4-team scrimmage with some of the top teams in Mid-Michigan — Flint Beecher, Grand Blanc, Flint Powers and Holly. Some of the state’s top young talent will be on display including Beecher’s Monte Morris and Antuan Burks, Grand Blanc’s Jordan Fields and Bart Williams and Flint Powers Javontae Hawkins and Quin Langston. 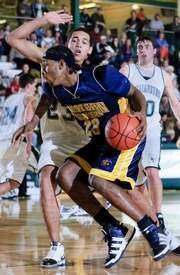 Darrell Williams, a 6-7 forward from Flint Northern, will play college ball at Lansing Community College this season. Williams is the last of a crop of players from Northern to sign to play college ball — Gerald Williams (Wayne State), Cameron LeFear (Sinclair CC), Don Lewis (Delta) and Douglas Toins (Lansing CC). Toins and Williams will also be joined by another Viking, Michael Martin, who transferred to LCC after his freshman season at a JUCO in Iowa. The trio had planned on playing with Lansing Eastern standout guard Cameron Sanchez, but two sources have indicated that Sanchez will instead go the prep school route. Patrick Hayes of the Flint Journal wrote a column about the recent death of Flint Northwestern basketball and football standout Willis “Ray” Arrington. A couple things really stood out to me, and both come from coaches. First, Flint Beecher head coach Mike Williams, who knew Ray well, didn’t really try to make sense of the death — it makes no sense, after all. He’s trying to find a way to save lives. There’s a principle there: Actions are accompanied by reactions. The outcome of one terrible decision was the loss of a young life. A young man who could have been a college graduate in five years and starting an adult life of promise, is gone — and for what? Certainly not to steal bread. This was not about survival, but about an attitude that might is always right and that the life of your neighbor isn’t worth anything. Wielding a gun doesn’t make you a man, it makes you less of a man. Men use their hands and their minds to achieve things that are truly worth achieving. So what will you do with this life, this example? Follow the same path? Say nothing in the face of wrong when right is achievable? Do nothing to modify your life, to re-route the road you’re traveling down? If you’re prepared to do nothing, also then be prepared for the possibility of a similar outcome. It wasn’t fate that took your friend away. Don’t allow his death to simply be a tragedy. Let his example of the worst possible outcome of one bad decision be your guide to live right, love your neighbor and value what is truly good. The Heat are already in Miami, so why not the Flames? On Saturday, fans of basketball in Flint have an opportunity to help the Flint Flames, a fledgling semi-professional women’s basketball team, travel to national in Miami later this month. They earned the right to compete in the WBCBL tournament after pulling a couple upsets on Aug. 7. Now, they need your help to keep going. They are hosting a fundraiser Saturday in the Flint area. Here’s more from The Flint Journal. Well-wishers do have another chance to show the Flames their support, however. To help offset the cost of traveling to nationals, which will be Aug. 21-22 in Miami, the team is hosting a ‘Fundraiser 2 The Finals’ from noon-5 p.m. Saturday, Aug. 14, at Thompson Creek Turkey Farm on Hill Road. There will be a bottle drive, as well as the chance to make donations. People donating $10 or more will receive a commemorative Flames t-shirt. There will also be opportunities to meet players, play games and get discounts on Thompson Creek food for those who donate. Did a future Mr. Basketball just commit to the University of Dayton? Lansing Eastern’s LaDontae Henton recently committed to Brian Gregory and he will be a Flyer in 2011. I’ve had the opportunity to visit Dayton for a game and, let me just say, it has to be among the best venues for basketball I’ve ever seen. People down there are basketball crazy, and certainly don’t consider their brand of ball to be mid-major. Henton, like his coach opined in the above linked article, is the best senior in Michigan. It’s truly an unbelievable get for the Flyers. He’s nearly 6-foot-6 and can play multiple positions. More important is that he is ready for college ball physically, and he still has a year to get stronger. Willis “Ray” Arrington, a junior forward at Flint Northwestern this past season, lost his life on Wednesday night in Flint. Arrington was among Northwestern’s young core of talented players eying a run at a class A state title this upcoming season. As fate would have it, Arrington’s last game as a Wildcat was his best: 18 points and nine rebounds in the regionals versus Mt. Pleasant. All the details surrounding his death have not yet been released. Suffice it to say, Ray lost his life and it’s tragic. Too many young men are leaving this city before they’ve really had the opportunity to live. For those of you who knew him, please help my friend Patrick tell his story. Regardless of how or why it happened, the Flint basketball community suffered a great loss in Willis Arrington. One of the best ways to cope with the tragedy of a life lost too soon is to talk about the good things Ray meant to you. If there are coaches, teammates, opponents and friends out there who would like to share their favorite memory of Ray for a memorial column about him in the Flint Journal, please e-mail them to [email protected] or inbox Patrick on Facebook by Sunday afternoon. UMHoops.com, probably the best basketball site in the state (in my humble opinion), recently ranked the state’s top 10 seniors for 2011. You can see the ranking here. Read it before moving on to my comments, as I’d prefer not to poison the well. — I’ve always had issues with the mingling of prospects with players. Amir Williams is clearly the best prospect in Michigan, but there is absolutely no way he’s the best player. There are three or four guys on that list who are better players, and several more not on the list. — No one would question Dwaun Anderson‘s ability to attack the basket and finish above the rim, but can we be more realistic about his ability right now? To say that he has a “consistent” jumper is just not based in reality. He’d be number two on my prospect list, but he’s not the second-best player in Michigan. He has a long way to go, in terms of skill, before he can be an impact player at the high major level — and the bulk of that work is shooting. — People who know me also know that I’ve never been the biggest fan of LaDontae Henton‘s game. I thought he was overrated from day one when my old friend Sam Hosey gave him the superstar treatment in the LSJ as an incoming freshman. Well, guess what? I was wrong. Henton is a beast. Big, strong, skilled and the highest-impact player in the state. If he had already signed with an in-state school (or played in the Detroit area), he’d be in the top three. Henton at eight is almost as laughable as Patrick Lucas-Perry at nine. Lucas-Perry is a fine player, but he’s not even the best senior in Flint. And can we please dispense with the UM/MSU interest attached PLP? That’s a myth. — Lists are tough to compile, but they are always fun to debate. I just know if you made a list of only the best basketball players in the state (and not the best prospects), some of those names wouldn’t appear. Flint Northern’s 6-6 reserve center, Don Lewis, recently signed with Coach Lonnie Griffin at Delta College near Saginaw. Lewis is a big-bodied kid who played somewhat sparingly for the Vikings as a senior after returning to Flint following a stint in Nevada. Flint Northern now has four players from last season’s team who have signed to play in college — Lewis, Douglas Toins, Cam Lefear and Gerald Williams-Taylor. Darrell Wiliams, a bouncy 6-7 forward, has yet to sign. Lewis joins a recruiting class that includes Saginaw Heritage’s star guard AJ Thomas, USA’s Clinton Kreuger and Flint Southwestern’s JoJuan Graham.